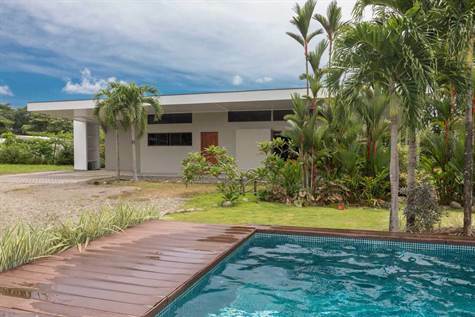 Many of our clients here in southern Costa Rica ask for a nice home that is “walking distance to the beach.” Our usual answer is that along our Pacific coastline, such homes are scarce. This, however, is one of them. The clean, bright contemporary design with high sloped ceiling in the living area allows ambient light to softly illuminate the whole house. The combination of light colors on the walls with lots of glass and a glossy ceiling give the feeling of an arboretum, but with the tropical plants on the outside. Access is easy with all living spaces on one floor. The master suite, along with its en suite bath, has “country views” of pasture lands, trees and mountains. Custom hardwood closet doors accent the large bedroom and specially selected fixtures and tile add a luxurious look to the bath. With ceiling fans and split AC units in the bedrooms and living areas, you can select your comfort level by opening windows and doors, using just the fans, or turning on an AC. You will find new appliances in the kitchen and plenty of space to create your snacks, meals and drinks. The large island is one option for convenient dining, but the kitchen/dining area also opens onto a large covered patio where you can turn meals into pleasant experiences listening to the sound of nature and feeling the evening or early morning breezes. When the moon is full, the whole area around you will glow like a softly lit paper lantern while you chat with friends, grill the day’s catch or read a good book. Depending on your preference and pricing, you can buy the home fully furnished or furnish it yourself. Some Buyers enjoy the convenience of “suitcase ready” while others like the adventure of finding just the right style of furniture and decorations to suit their tastes.